Fractures of the spine are serious injuries. There are a number of different types of spinal fracture with differing symptoms, causes and treatment. Traumatic injury: Most spinal fractures are caused by high velocity, violent trauma; such as a fall from a height or car accident. Because of the amount of force needed to fracture the strong vertebral bones, there is often injury to other structures as well; sometimes including the spinal cord. Men are about 4 times more likely to incur these types of injury than women and they most often occur in young adults. Fractures of this type are most common in the cervical and lumbar regions of the spine. Non-traumatic injury: Spinal fractures can also occur without the presence of trauma. 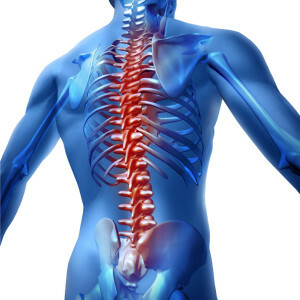 The fracture is usually the result of degeneration within the spine, usually over the course of many years or decades. These types of fractures are commonly compression type fractures. These types of fractures are more common in the elderly and in the lumbar spine. Spinal tumors can also sometimes cause spinal fractures. Acute spinal fractures usually are accompanied by pain that is moderate to severe and is worsened by movement. Sometimes if the fracture is caused by a violent trauma there will be other injuries as well, so it can be difficult for the person to work out where the pain is coming from. In the acute phase of a trauma such as these, the injuries will be treated as a medical emergency and the person carefully immobilized to try to guard against the possibility of spinal cord injury. If nerves or the spinal cord are being compressed, there may be pain, numbness or tingling into one or both legs or arms. Spinal fractures that have occurred due to degenerative changes in the spine may present with different symptoms –back pain is usually present, but sometimes the patient is unaware that they have a spinal fracture until it shows up on a routine x-ray. There may be pain, tingling or numbness into the legs and symptoms may range from mild to severe. The treatment of spinal fractures depends entirely on the extent and type of fracture, and there are a number of different treatment options. For some people, immobilization is advised until the fracture is allowed to heal. This may take the form of bracing or traction in hospital. Pain medication is also often prescribed. Physical therapy can be useful to help manage pain, and to help strengthen muscles and regain function after the initial phases of the injury. Surgery is sometimes necessary and can take many forms, depending on the nature and extent of the fracture. Your surgeon will fully explain the surgical procedure and post-operative care if surgery has been advised for you. Following surgery a period of rehabilitation usually will be advised to help you to return to normal life.